If dedication, hard work, and/or experience were all it takes to get a new political party off the ground, the Libertarian Party would have a significant caucus in Congress right now. It doesn’t. Some other third parties have some spikes of success. Socialist Bernie Sanders got into Congress (though he was technically an independent). The Reform Party managed to elect Jesse Ventura for governor of Minnesota. But for persistent ballot access and boots on the ground, it’s hard to beat the Libertarian Party as third parties go. Alas, this isn’t saying much. Given this limited level of success pundits, political scientists, and voters generally write off third parties, save when they get a celebrity candidate (like Ross Perot or Jesse Ventura). There is even a “law” to this effect: Duverger’s Law, that says that third parties cannot get traction in a plurality-take-all system like we have for most U.S. elections. I have an audacious claim. I claim that Duverger’s Law is not an unbreakable iron law. I have identified two loopholes. In theory, the Libertarian Party could exploit them and become a major party. In the real world, it won’t. There are too many dedicated activists who find the price of success to be too high. After nearly a quarter century following the party line, I spearheaded an attempt to get the party to play realistic politics. The attempt was half successful, temporarily. Half success is not good enough. It is easier to start from scratch. To find the loopholes, we start with why Duverger’s Law works most of the time. Observation 1: You have to win! Yet, by themselves all these goals are utterly worthless! The United States does not elect its legislatures using proportional representation. It has district elections, and most of these districts are single-member. A party can theoretically win 20% of the vote overall and still not win a single seat. A party that wins only 5% of the vote overall is extremely unlikely to win a single seat. The Green, Libertarian, and Constitution parties operate as if the U.S. had proportional representation. Strategies which work in Europe do not apply in the United States. To obtain a seat at the table in the U.S., you have to win somewhere. In a single-member district race there is no prize for second or third place. Win or be irrelevant. This is a very simple observation, trivial to verify. Yet time and time again, activists and strategists within existing third parties go into denial and try to rationalize around this fact. While this is an easy to understand fact, it can be hard to accept for the dedicated. It is an inconvenient truth. True, there are some proportional representation races in this country, especially at the local level. And third parties have done better there. But most of these races are non-partisan, so why have third parties for non-partisan races? It is true that you can get some publicity by running for office on a third party ticket. But you can get publicity for your ideas many other ways — cheaper ways. This is even truer in the Internet Age than in the past. 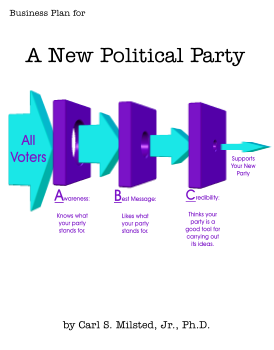 Third parties are mostly pointless without at least prospect of eventual victory. While this observation may appear trivial, it has profound strategic implications for marketing a political party. In the next chapter we shall look at our first theorem, based on this simple observation. The laws of political science impose a hard constraint on U.S. political parties, and the Libertarian, Green, and Constitution parties all violate it.